When your tabs are in the OneTab list, you will save up to 95% of memory because you will have reduced the number of open tabs. Open this menu by right clicking inside any web page. You can now send just the current tab to OneTab. If you right click on a web link, you'll see an option to send that web link directly to OneTab without having to open the link first. You can click the 'exclude web site from OneTab' button to prevent tabs from the current web site from being sent to OneTab. 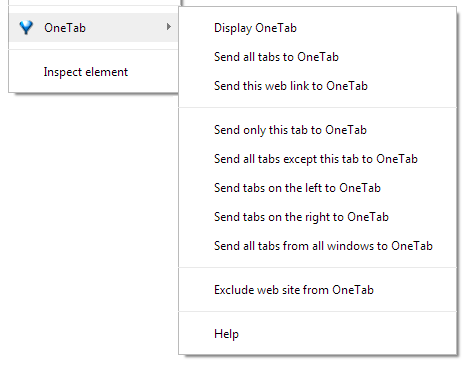 This exclusion will not apply if you specifically use the right click menu to send just one specific tab to OneTab. For a quick way to name a tab group, click the text that says e.g. "2 tabs". This will cause a yellow box to appear where you can give your tab group a name. After you name a tab group, you can use the OneTab right click menu to send tabs directly to those named tab groups. If you click the "More..." button on your OneTab page and then choose 'Star this tab group', a star icon will be displayed next to the tab group and it will always appear at the top of your list of tab groups. If you have multiple starred tab groups, they will appear in the order that you set them as starred. If you choose 'Lock this tab group', a lock icon will be displayed next to the tab group. Locking a tab group prevents you from accidentally deleting it. When you restore any tabs from this tab group, they will remain in your OneTab list instead of being removed. If you would like to change these keyboard shortcuts, right click on the blue OneTab browser toolbar icon, click 'Manage', then at the bottom of the page click 'Configure Commands / Keyboard Shortcuts'. You can also set your own keyboard shortcut to mimic the effect of clicking the blue OneTab icon which will send all tabs in the current window to OneTab. To do this, from the keyboard shortcuts settings screen described above, specify a shortcut in the box where it says "Activate the extension". Click the 'Options' link in the top right corner of your OneTab page. You can set your preferences for pinned tabs, choosing which window to restore tabs to, startup preferences and for handling of duplicate tabs. See the options screen for more detailed information. Don't worry about closing OneTab - you will not lose your stored tabs. Even if you close all tabs and exit your web browser and restart your computer, the tabs you have stored in OneTab will not be lost. Please leave us a rating in the Chrome Web Store if you like what we are doing! Thanks for using OneTab. We love to hear from you. If you have a feature request, bug report, or other comment, please contact us here.